Artist Colin See-Paynton was born in Bedfordshire, but for the last thirty years he has lived in Berriew, Powys. He is a keen angler and bird watcher, and as a child he spent much of his time on the banks of the Great Ouse fishing for chub, pike and silvery dace. 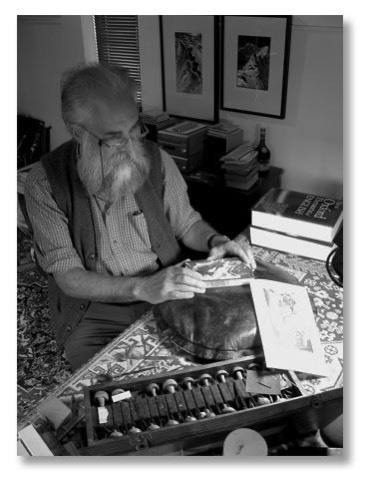 Colin studied at the Northampton School of Art and is regarded as one of the finest wood engravers working today. He is a Fellow of the Royal Cambrian Academy, Honorary Fellow of the Royal Society of Painter Printmakers and a member of the Society of Wood Engravers. He has gained international recognition and his engravings are held in many major collections. His work is based on meticulous observation of the natural world and yet it has an almost abstract quality within the intricacy of the patterning and layering of images. His influences might be said to derive from Japanese prints and also the work of artists such as Thomas Bewick, Charles Tunnicliffe, Agnes Miller Parker and Gertrude Hermes. In his latest book, Air and Water, Colin creates compositions of great complexity, leading the eye through air and water, capturing the fast and fleeting movements of birds and fish at the same time. The book includes extracts of angling literature chosen by Keith Harwood.